Spring 2011 Awareness Event | "MCSpirit!" 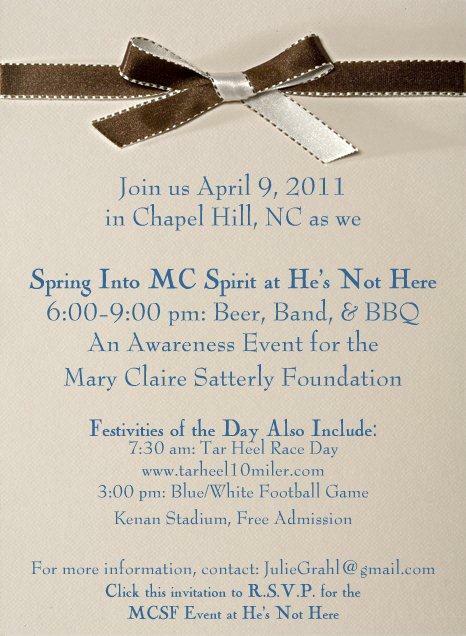 Runners and non-runners alike, mark your calendars for April 9, 2011 for a fun and festive day in Chapel Hill with activities to support the Mary Claire Satterly Foundation. One post-race festivity includes the Blue-White Spring Football Game at 3 p.m. For the first time in school history, the game will be televised nationally by ESPN. And even better, admission to the Blue-White Game is free. Finally, to close out a wonderful day we are teaming up with He’s Not Here, Sweetwater Brewery, and Bills BBQ from Wilson, NC for an awareness event to support the Mary Claire Satterly Foundation. Join friends, family, and foundation supporters, for bbq, beer, and live music. You’ll also have a chance to lean more about the latest MCS Foundation projects and events, and get a sneak peak of our new website. To help us get an accurate number on attendance for some of the best bbq, coleslaw, and brunswick stew in the state, an RSVP helps us greatly. Simply send an email to juliegrahl@gmail.com, and you will receive an invite like the one above soon after. Please forward to all your family and friends, as well! So get ready to tip up a Blue Cup and hope to see you there!